Hi, friends! 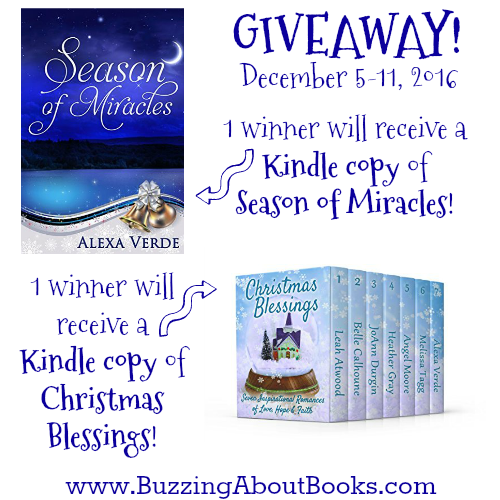 I recently shared my thoughts about Alexa Verde’s Season of Miracles, and I’m excited to let you know that Alexa has graciously offered to give away copies of this heartwarming holiday tale! 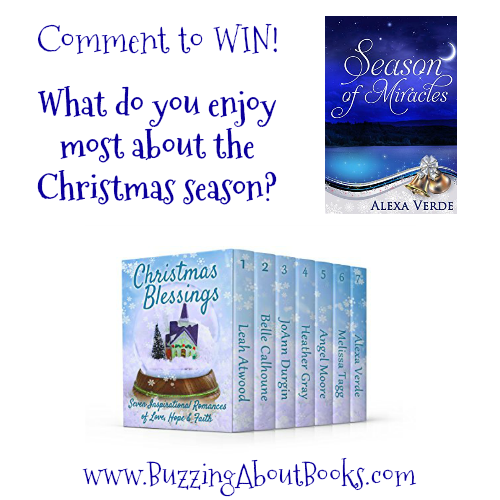 One lucky commenter will receive a Kindle copy of Season of Miracles and another will receive a Kindle copy of Christmas Blessings, a collection of 7 faith-filled, heartwarming romances from today’s bestselling Christian authors that includes Season of Miracles. What do you enjoy most about the Christmas season? Leave a comment below letting us know what you enjoy most about the Christmas season. The giveaway ends Sunday, December 11 at midnight CST. 2 winners will be chosen and announced on Monday, December 12. 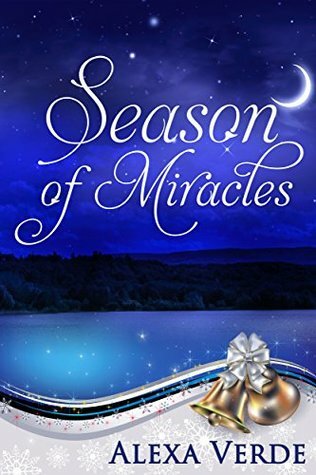 Nurse Lana Smith gives herself a gift for Christmas, a fresh start in a small town. After escaping a dead-end relationship with a celebrity, she avoids her patient’s grandson, a pro football player. When Arturo gradually thaws her frozen heart, can her Christmas wish for family and affection come true? Football is Arturo De La Vega’s life, but he returns to his hometown to help his ailing grandfather. Lana challenges Arturo to reach for stars of faith and love. Is Arturo’s quest for glory worth crushing Lana’s dreams and sacrificing his heart’s true desire? Although Kate Jergens presents her life as the picture of perfection to everyone, old insecurities prevent her from letting people see who she really is. As the holidays approach, those insecurities reappear. Luke Tatum realizes he doesn’t know Kate as well as he thought when he sees her with her guard down. As he discovers who Kate really is, his admiration and attraction to her grows. When faced with the possibility of losing someone she loves, Kate’s faith wavers. This Christmas, will she accept support from Luke or will she push him away? Maggie Kilcannon lives in Breeze Point, Cape Cod after leaving her native Ireland. 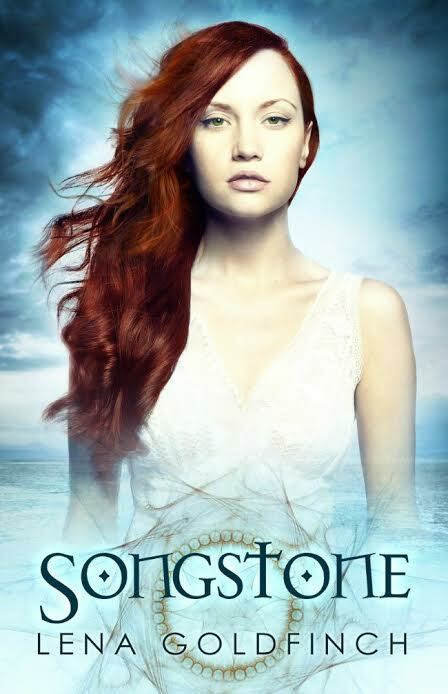 After tragically losing her parents, Maggie’s weary about loving and losing anyone. When she meets Alec Donahue, a soldier on Christmas leave, she falls madly in love with him. Can she live with the uncertainty of loving a soldier on active duty? Alec Donahue always wanted to serve his country, but his life changes when he meets the beautiful, spirited Maggie. He wants forever with Maggie, who’s reluctant to give her heart to someone who might leave her. Can Alec make Maggie believe in happily ever after? Ellie Franklin and Ryan Sullivan are the hometown sweethearts of Cade’s Corner, Ohio. As their Christmas wedding approaches, Ryan is expected back from his second deployment to Afghanistan. When an unforeseen event occurs, will Ellie’s plans be postponed or come to a screeching halt? With faith, family, and the support of an entire town behind her, will this bride’s prayers for a holiday miracle be answered? Avery’s a journalist and mom to teenager Eli. Gavin’s an enigmatic photographer. A botched schedule lands them all in a rental car for Christmas. With everything that goes wrong, it’ll take a miracle to get them anywhere. But miracles come in surprising packages. Like a bait shop owner and a family that can’t agree on how to remove a skunk’s stink. Join the trio as they learn reaching the destination doesn’t mean the journey’s over. God has so much more in store for them. After all—anything can happen on the road to Nowhere. When Serena comes home determined to save her mother’s shop, the manager blames her for her mother’s troubles. But he’s the only person she can rely on for help. Has Michael wasted the years he spent trying to keep All Things Christmas open? Serena’s resolve to correct things financially threatens the heart of the store. It’s about Christmas. Not just sales. Has Serena become so calculating that she doesn’t celebrate her faith anymore? Drew Renwycke never planned to move home and take over the farm. But he’s spent too many years watching his siblings unravel—including Colin. When Maren lands on his doorstep, he realizes she may be the key to coaxing his brother home. But what if he’s in for an unexpected holiday romance himself? 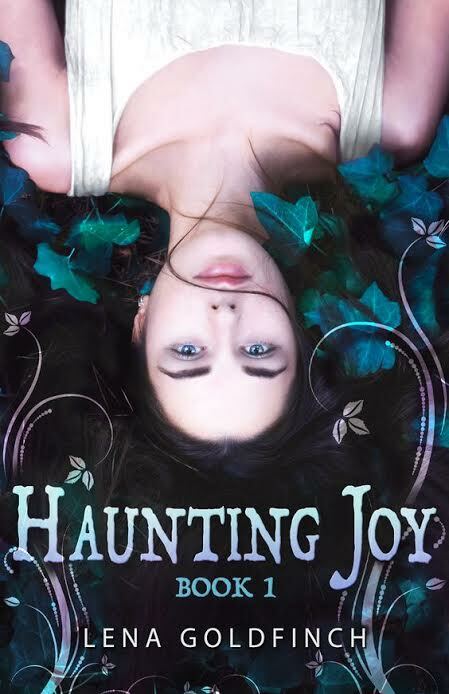 Violet Hawthorne is beyond mortified when her brother Ezra turns their deceased parents’ New England country inn into a brothel to accommodate the nearby lumberjacks; but when Violet’s own reputation is compromised, the inn becomes the least of her worries. In an effort to salvage her good name, Violet is forced into an engagement with a taciturn acquaintance; Vance Everstone. As she prepares for a society wedding, Violet learns that her brother had staked her hand in marriage in a heated poker game with the unsavory Rowen Steele, and Ezra had lost. Now Rowen is determined to cash in on his IOU. With danger stalking her and a new fiance who hides both his emotion and his past, Violet must decide who to trust and who to leave behind. Dawn Crandall creates beautiful story worlds, and fans of the Everstone Chronicles are sure to love its latest installment! Vance Everstone plays quite the hero in this book, a complete transformation for the former scoundrel. From loathing him to loving him, I was delighted by his reformation! 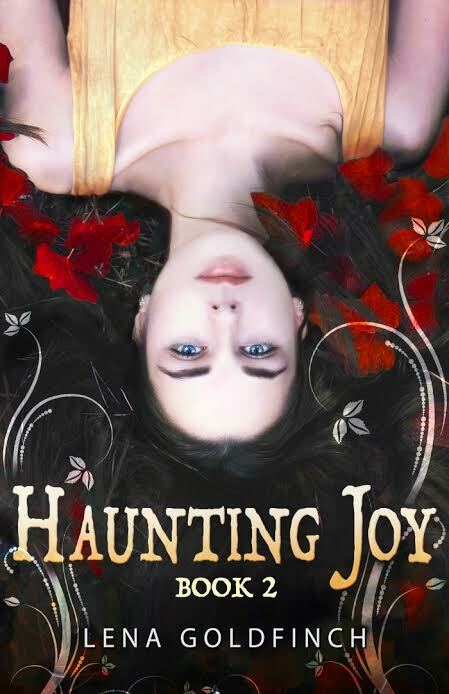 Intriguing and enchanting, Vance and Violet’s journey is teeming with drama and romance. 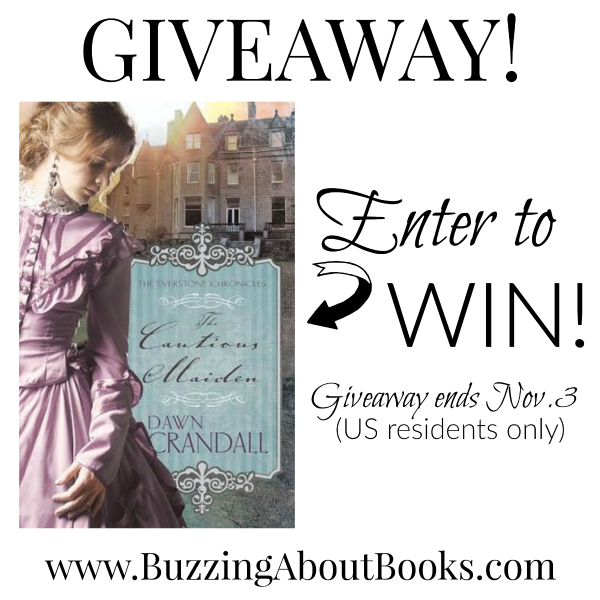 The Cautious Maiden is an enthralling tale, and I loved every minute! 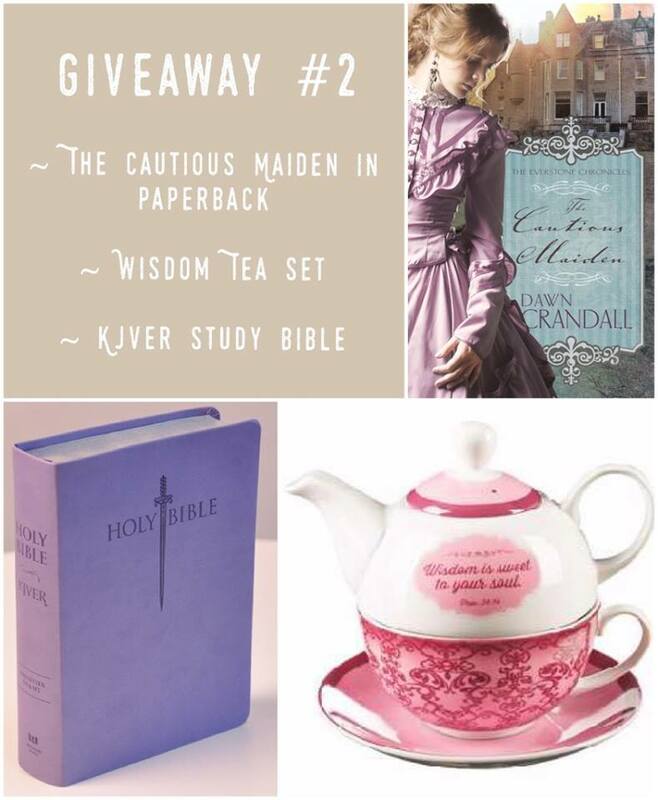 Thanks to the publisher, Whitaker House, one lucky Buzzing About Books reader will win a print copy of The Cautious Maiden! Leave a comment below, and be sure to include your email address. The giveaway ends Thursday, November 3 at midnight CDT. 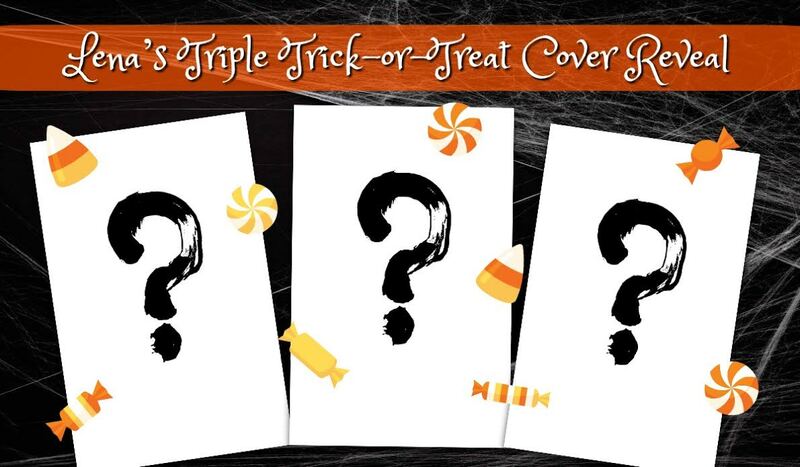 The winner will be announced on this blog and notified by email on November 4. 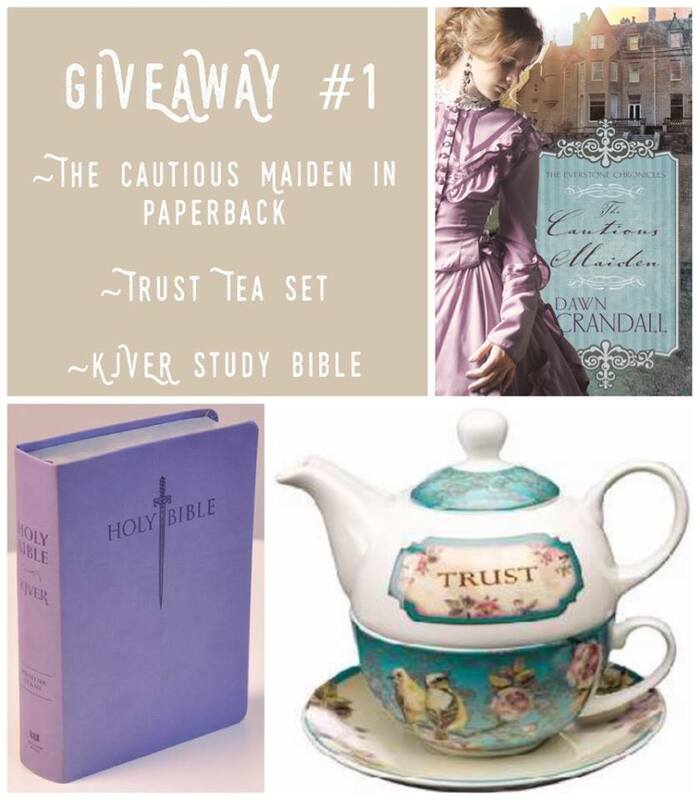 Dawn is celebrating the release of The Cautious Maiden with not one, but TWO giveaways! Click here to enter! 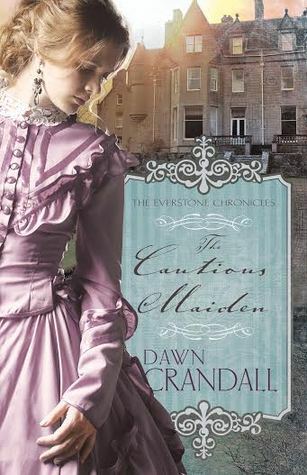 5 copies of The Cautious Maiden are up for grabs in a Goodreads giveaway ending November 4. Click here to enter! No review was required, and all thoughts expressed are my own. Don’t miss books three (A Sister’s Wish) and four (An Amish Family Christmas) in Shelley Shepard Gray’s Charmed Amish Life series. In A Sister’s Wish, when Amelia gets hurt, it sets off a chain of events that forces them to consider their future together—and face their past mistakes. There’s a chance for love… but only if Simon dares to trust Amelia with the secrets of his past. In An Amish Family Christmas, Christmas is a time for family, and as the holiday draws closer, Julia and Levi will have to face their pasts together . . . in order to find the healing, support and love they so desperately desire. 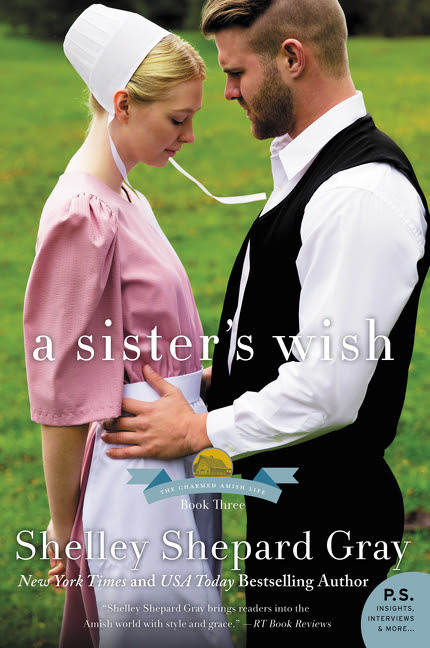 Enter to win a book pack (a copy of A Sister’s Wish and a copy of An Amish Family Christmas) from Shelley. Five winners will be chosen! The winners will be announced November 7th on Shelley’s blog! Amelia Kinsinger is the perfect Amish woman—at least according to her neighbors. And while Amelia takes pride in her role as homemaker, she’s also harboring a secret: She’s been in love with bad boy Simon Hochstetler for as long as she can remember. Too bad he’s about as far from “perfect” as an Amish man could get . . . but that’s exactly why she’s so drawn to him. Life hasn’t been kind to Simon. He ran away from an abusive home at fifteen and things went downhill from there. Eventually, Simon landed in prison. But the experience changed him. Now back in Charm as a grown man, he’s determined to make a new life for himself and not think too much about his wild past . . . unless it pertains to Amelia. But when Amelia gets hurt, it sets off a chain of events that forces them to consider their future together—and face their past mistakes. There’s a chance for love . . . but only if Simon dares to trust Amelia with the secrets of his past. I have really enjoyed The Charmed Amish Life stories, and A Sister’s Wish is my favorite of the series! 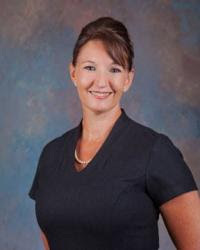 Shelley Shepard Gray is a wonderful storyteller who brings Charm, Ohio, and its residents to life with vivid details and descriptions and excellent characterization. From the moment I began reading A Sister’s Wish, I was completely captivated by Amelia and Simon’s story! 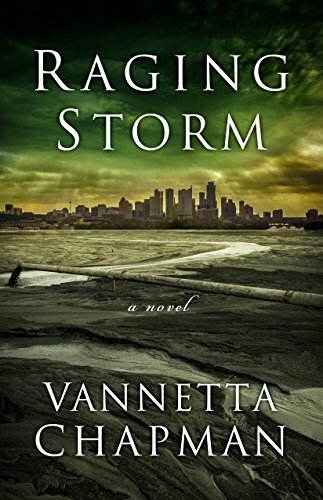 I loved the complexities of the Kinsinger and Hochstetler families and their dramatic and emotional journeys. Beautifully told, this poignant story is sure to tug at your heartstrings! 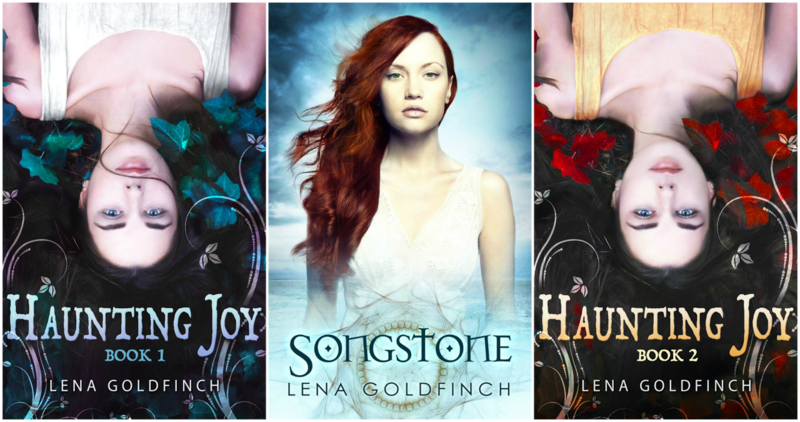 For those who have not read Books 1 and 2, A Sister’s Wish can be enjoyed independently. However, I encourage you to read the series in order for a greater understanding and appreciation of the characters and their stories. 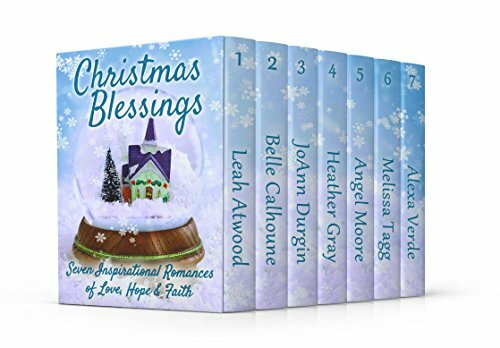 But when Julia, his young widowed neighbor, asks for his help with a Christmas project, Levi finds a sense of purpose for the first time in months. She and her daughter are new to Charm and could use a friend, a job Levi takes personally. Soon enough, friendship grows into attraction, but Levi can’t help having doubts. There’s something about Julia that doesn’t ring quite true . . .
Like Levi, Julia Kemps has survived her fair share of hardships—but only by hiding the truth of her past. Being an unmarried mother in an Amish community was unthinkable. Feeling hopeless, Julia did the only thing she could do: she moved to a new town and pretended to be a widow. But meeting Levi, she’s hopeful for the first time. Little by little, she begins to imagine telling him her darkest secret, and eventually . . . perhaps even sharing her life with him. Christmas is a time for family, and as the holiday draws closer, Julia and Levi will have to face their pasts together . . . in order to find the healing, support and love they so desperately desire. 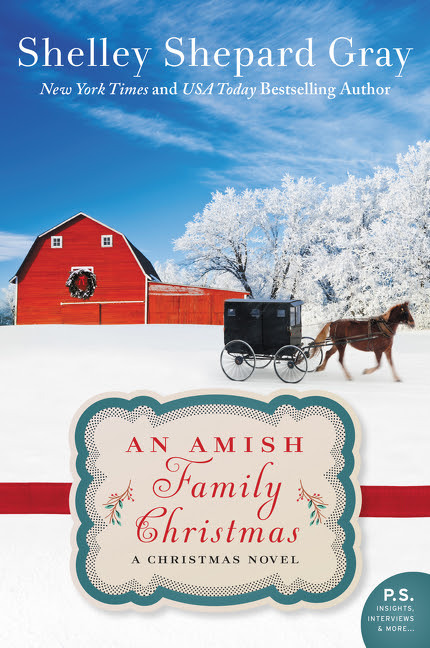 An Amish Family Christmas is a wonderful culmination of a wonderful series! I have loved visiting the special community of Charm, Ohio and eagerly anticipated Levi Kinsinger’s story. When Levi returns to Charm, he meets a young woman, Julia, who needs his help. But with secrets to keep, will Julia let herself trust her neighbor and the help he offers? I really enjoyed Levi and Julia’s dramatic story and their coming to terms with the pain and hardships of their pasts. I also delighted in revisiting the other members of the Kinsinger family as they gathered together in love and support of each other. An Amish Family Christmas is the fourth and final book in The Charmed Amish Life series. If you enjoy Amish fiction and have not read this series, I encourage you to do so from beginning to end! I received a complimentary copy of A Sister’s Wish and An Amish Family Christmas. No review was required, and all thoughts expressed are my own. Click here to read what other bloggers are saying about these books. Hello, dear readers! 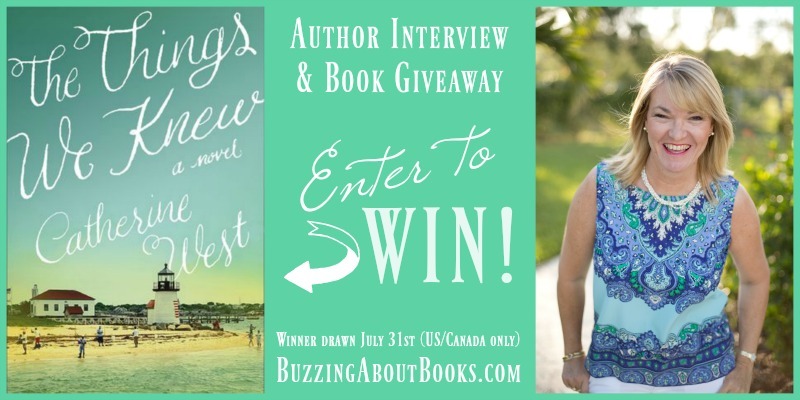 I’m so excited to welcome Catherine West back to Buzzing About Books! She has graciously answered a few questions about her latest release, The Things We Knew, and is offering a print copy for giveaway. Trust me, this is one you don’t want to miss! 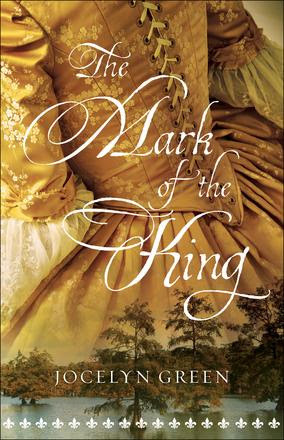 Read my review of this compelling story here and purchase a copy here. Welcome, Cathy!! I know you are beyond thrilled about the release of The Things We Knew! Please tell us about your road to publication with HarperCollins Christian Publishing. CW: How much time do you have? 🙂 While I’ve been previously published with a small press, and then Indie published, my dream has always been to write for a traditional publisher. Even when the Christian publishing world began shrinking, with everyone telling me, just stick with Indie, I knew I had to pursue this dream, crazy as it might be. Fortunately, I have an agent who shares my dreams, and she never gave up on this one. It all came together in God’s perfect timing, and we are both absolutely thrilled! What is one of the most memorable moments of your writing journey thus far? I love family dramas, and you portrayed the dynamics of the Carlisle family so well. Who or what inspired this complex family? CW: I love family dramas too! It had been a goal of mine to write one, so when this story came together, I was super excited. I don’t think there was anything in particular that inspired the story, I just delved into my experiences with family and kind of went from there. 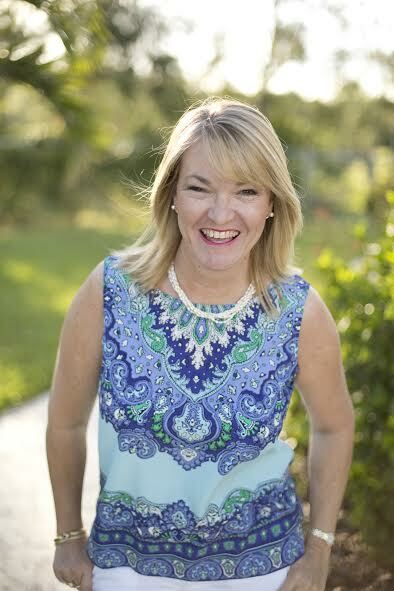 If we’re talking author inspiration, then I admit to being heavily inspired by the great authors who do family drama so well – Karen Kingsbury was one of my first CBA authors I ever read, and I loved the Baxter series. 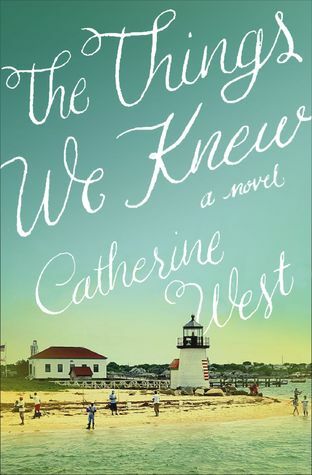 Be sure to check out Cathy’s The Things We Knew Pinterest board! Did the characters surprise or challenge you in any way as you were writing this story? CW: I’m always surprised. Lynette went through a lot of changes in the several re-writes of this book. She’s actually a lot stronger now than she was when I first wrote her. In a good way. She’s learned to stand on her own two feet and speak for herself. Gray was the character that kind of took the pen out of my hands, if you will. I didn’t know how much of an impact he was going to have when I first thought him up . . . and I had to really work to tone him down or he would have happily taken over the entire story. The Things We Knew is beautifully written and the imagery is vivid! Have you spent much time on the island of Nantucket? Do you paint? CW: I haven’t actually been to Nantucket, although when you post this, I will have! My husband surprised me with a trip and an arranged book signing the day The Things We Knew releases! While I was writing the story though, I spent a lot of time on Google maps, and walked the island as much as I could . . . it was fascinating then of course, but I can’t wait to see it in person! Do I paint? Not a lot now, but yes, I was quite artistic all through my school years. I dabble now and again, but time is really the big block there. When I am not writing, I want to read. I’m hoping when life calms down some (if!) that I’ll pick up a brush again some day! 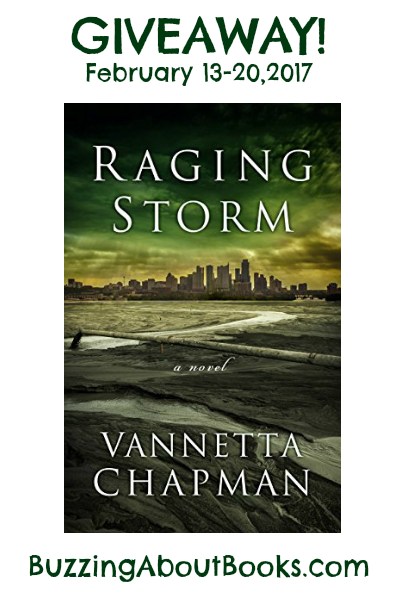 You address a number of issues in this novel that I believe will resonate with many readers. Did a particular message or lesson resonate with you as you penned the narrative? CW: All my books carry the theme of redemption and forgiveness, and I think this particular story points toward those things as well. And hope. Even when things look the bleakest, there is always hope. Do you have a favorite story moment or scene you would like to share? crowd. They were meeting with him later that afternoon. the ballroom for a couple of hours. They’d made mistakes last night. and down. And then she smiled. and Chuck Taylors. A bit too much makeup, but it didn’t matter. She had the most beautiful smile he’d ever seen. What do you hope readers will take away from this story? CW: A sense of hope, an appreciation for family, and the knowledge that second chances are always possible when we walk in light and commit to seeking truth. Do you plan to revisit the Carlisle family in future novels? I would love to continue their stories! When writing? Coffee. Coffee. Coffee. When reading? A cozy blanket in winter, and a cold drink in summer. When traveling? iPad and laptop. Not one. Both. What can we look forward to next? Thirteen years ago, Natalie lost a part of herself when her twin sister died. Will traveling back to the family winery finally put the memory to rest, or will it completely destroy her? 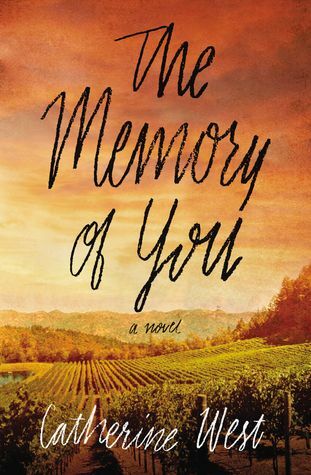 When Natalie Mitchell learns her beloved grandfather has had a heart attack, she’s forced to return to their family-owned winery in Sonoma, something she never intended to do. She’s avoided her grandparents’ sprawling home and all its memories since the summer her sister died—the awful summer Natalie’s nightmares began. But the winery is failing, and Natalie’s father wants her to shut it down. As the majority shareholder, she has the power to do so. And Natalie never says no to her father. Tanner Collins, the vintner on Maoilios, is trying to salvage a bad season and put the Mitchell family’s winery back in business. When Natalie Mitchell shows up, Tanner sees his future about to be crushed. Natalie intends to close the gates, unless he can convince her otherwise. But the Natalie he remembers from childhood is long gone, and he’s not so sure he likes the woman she’s become. Still, the haunted look she wears hints at secrets he wants to unearth. He soon discovers that on the night her sister died, the real Natalie died too. And Tanner must do whatever it takes to resurrect her. But finding freedom from the past means facing it. 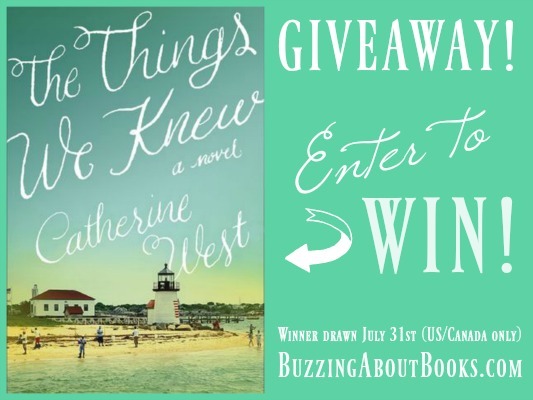 One lucky reader will win a print copy of The Things We Knew! Leave a comment below, and be sure to include your email address. The giveaway ends Saturday, July 30th at midnight CDT. The winner will announced and emailed on July 31st. Thank you so much for joining us, Catherine! Thank you for having me! I love to hear from my readers so if you want to chat about The Things We Knew or anything else, feel free to get in touch via email or FB or any of my other social media haunts! And thank you for reading!